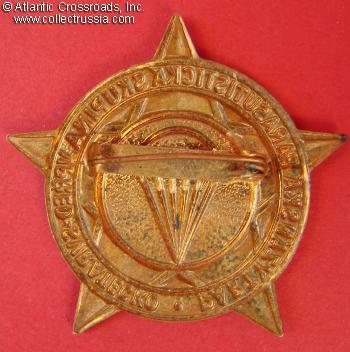 Slovak Airborne Partisan Unit Vpred (Forward), veteran's badge, circa 1960s-70s. Brass, "cold" epoxy enamel. 44.6 mm wide. The "cold" enamel is of inferior quality but appears to be original to the badge. 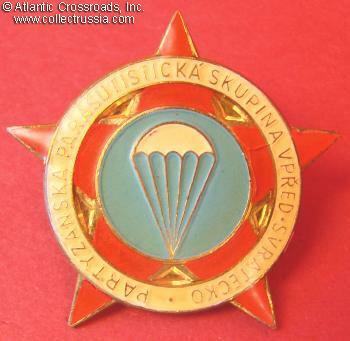 Inscribed "Svratetsk Partisan Parachute Unit Vpred". Surface buffing and hairline cracks to enamel; very fine overall condition. First members of this unit were reportedly parachuted into Slovakia in mid September 1944, in support of the Slovak national uprising.